This boldly patterned scarf is an oblong 20 x 63" piece. It contains several variations of color from white to black and all of the greys in between. 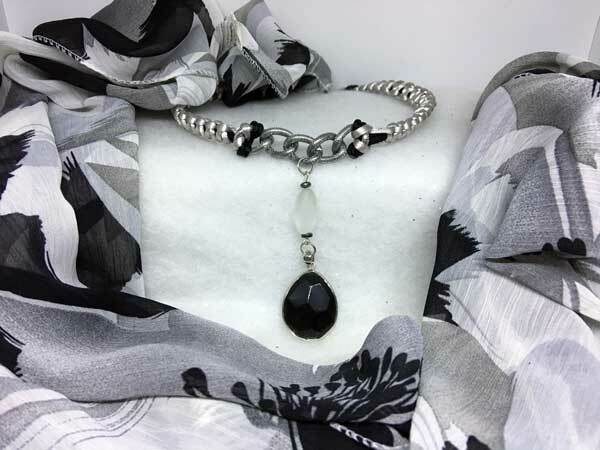 This corded necklace is made using mostly satinique cording in black and silver along with a section of silver textured chain in the center. The length can vary from about 18 to 21 inches with a center jeweled piece that adds over 3 inches. It starts with a large, twisted frosted rock quartz, surrounded by hemalyke discs. Hanging from that is a faceted black onyx teardrop. The piece is finished with a lobster claw clasp and added chain for more versatility with the length.